Strategic gameplay is a close analogy for the dynamics of complex systems. In the first set of studio projects, students played competitive and cooperative strategic board games to explore game dynamics, create information visualizations of these dynamics, and then design strategic games — in essence, designing complex emergent systems. As Pardee RAND continues to expand and reimagine the curriculum, two exciting initiatives are currently underway. The Winter '17 quarter saw the pilot of our first design studio course, entitled Equitable and Effective Policing in an Era of Social Media and Distributed Civil Movements (#BlackLivesMatter). The format of the studio is dynamic and interactive, with 10 students participating in this new approach being co-taught by Distinguished Visiting Professor Ann Pendleton-Jullian and Pardee RAND professor Osonde Osoba. Pendleton-Jullian was a key consultant on our Reimagining effort and is in residence this spring, visiting from the Ohio State University's Knowlton School of Architecture. This pilot studio is the first of several that are planned as a component of the updated curriculum in 2017-18. Stay tuned for information on more studio offerings. 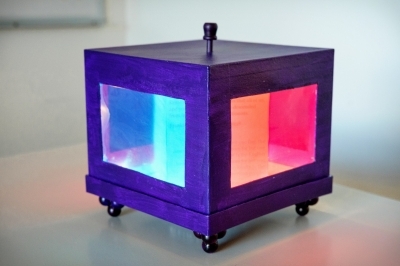 Sara Turner's tech lab application included a cardboard box titled "Do you see what I see." In her Artist's Statement, Turner commented, "We have gotten very good at filtering out information that doesn’t confirm our world views. This piece is intended to communicate that fact in a very physical, tactile way and give people the opportunity to literally see what the other side sees (or saw) on a contentious policy issue — immigration." In conjunction with the studios, Pardee RAND will also be developing a Tech Lab to serve as a hub of innovation and experimentation for both students and faculty. The role and composition of the lab will be influenced by the students themselves. Professor Dave Baiocchi, who is spearheading the initiative, has recruited six students — Lauren Davis (cohort '15), Karen Lee ('16), Sujeong Park ('15), Josh Russell-Fritch ('16), Bonnie Triezenberg ('14), and Sara Turner ('15) — to help design and influence the eventual purpose of the lab as a part of their OJT. Three additional students — Nick Broten (cohort '15), Steve Davenport ('15), and Claire O'Hanlon ('13) — will constitute an advisory council and will participate in the ideation process throughout the pilot. Nearly 30 students applied for positions, and their submissions reflected the creativity and ingenuity of Pardee RAND students. Baiocchi noted, "One of the pilot’s goals was to discover the latent skills within the student body. The applications that we received reaffirmed how much talent sits within the Pardee RAND cohorts. We received everything from diagrams and drawings to music and video to physical creations."